I’m not talking about food labels. I’m talking about people labels. Life’s little hashtags that allow people to put us into boxes in their organized waffle-brains. I’m going to discuss a few areas of life in which those of us out of the mainstream are viewed as weird, strange, or abnormal. I am vegan once I leave the house. At home, I eat local pasture-raised eggs, zero dairy, and zero meat. I am vaguely considering adding the occasional meat product, but only ethically-raised meat. I avoid GMOs and buy organic groceries. I’m preparing to cut gluten from my diet after realizing that when I eat it, it makes me hurt. I am learning to listen to my body. Before I go to a restaurant, I have to look up the menu online and see if anything is vegan. I also try to avoid soy and corn because of GMOs. Now that I’m going gluten free, eating out will be nearly impossible. Hooray, challenges! They make us stronger, right? Right? Whatever, I’m going to Chipotle (and ignoring the soybean oil because even I have to have a line somewhere. I have also been known to demolish corn chips at Mexican restaurants. I’m not perfect, okay?). Hi, sorry, mine’s going to be annoying, I’m a craaazy vegan! I’ll have the spaghetti (listed in the menu as spaghetti and meatballs, with cheese), without any meatballs or cheese – just noodles and sauce. And the garlic toast, and do you know if any of the salad dressings are vegan? Okay, no salad, I just won’t worry about it. The pressure to just stop being a crazy psycho vegan hippie was enough to make me just eat the damn bun. I got sick, but I lack evidence to say it was really the bun. It might have been the greasy fries. Sorry, body. When I introduce myself in situations as a “dirty hippie,” or a “crazy vegan,” or a “crunchy granola freak,” even in jest or to break the mood, I am putting forward a bad image of myself. Dirty. Crazy. Freak. These are all negative words. If I don’t eat meat, eggs, or milk at a restaurant, I can ask for the vegan options without making a joke at my own expense to make the server feel better about having to serve me. I am 100% sure there are pickier customers out there. When it comes down to it, I’m pretty easy. Now that gluten is on my chopping block, things will get more complicated (and may result in fewer restaurant outings, sorry friends). 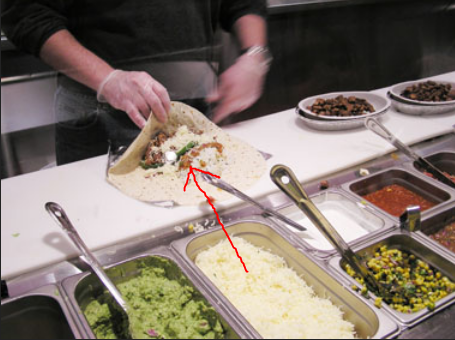 Correct placement of burrito when placing cheese on top. Directly in front of the cheese container. Sometimes they move the burrito in front of the guacamole, and then put the cheese on. This results in cheese falling into the guacamole, which makes me a very sassy lactose-intolerant vegan. (All acceptable labels). Those of us with dietary restrictions, whether self-imposed or medically necessary, should own them. Ask your questions and order your meal the way you want it without apology. Dine with patient, supportive people. Someone telling you to just deal with it and eat the bun is not going to help the situation. It is stressful to handle dietary restrictions in your own kitchen, let alone in a restaurant. Sure, a vegan can compromise on a dubious bun, but if someone had an allergy, they wouldn’t have that freedom. If you have food allergies, bring your medication/epi-pen just in case. I don’t use commercial shampoo, conditioner, deodorant, or toothpaste. I smell and look like a normal human! (I may still be figuring out the deodorant, to be perfectly honest; experiment #1 did not go smoothly… literally). I don’t use shampoo, because I’m a dirty hippie freak. I don’t use shampoo, because shampoos contain a lot of questionable chemical ingredients and I don’t want them in my body. I have used both of these explanations. One of them is detrimental to my cause. If I want others to consider the implications of slathering themselves with chemical ingredients, I need to frame my explanations with an educational and health-conscious perspective. I can’t just say, “I’m a dirty hippie,” because (a) I am not dirty and (b) unless YOU want to identify as a dirty hippie (which I am sure you don’t), you won’t even listen to my explanation of why (insert commercial product here) is bad for you. It’s all about presentation. I think medication is seriously over-prescribed. I focus on natural healing and nutrition over medication, and I feel much better for it. I have not gotten sick all winter, and I haven’t had any medications in months and months. I’m happy with it, and I’m happy to talk to people about it. The minimalist in me doesn’t shop much anyway, and the environmentalist in me wants to shop used. I do confess that I bought a blender on Amazon for $60 because I couldn’t find a used one that met my criteria. I’m a really picky eco-minimalist I guess. My Christmas list included “cloth napkins, from Goodwill is fine” so I really don’t require “new” to be satisfied. This goes against the grain of so many people’s inclinations that it stands out and gets questions. Instead of the tried-and-untrue “Oh, I’m a tree-hugger and MALLS ARE EVIL,” next time I’ll try a little “It’s better for my bank account and the environment to try and buy things used first!” It might get some better feedback. 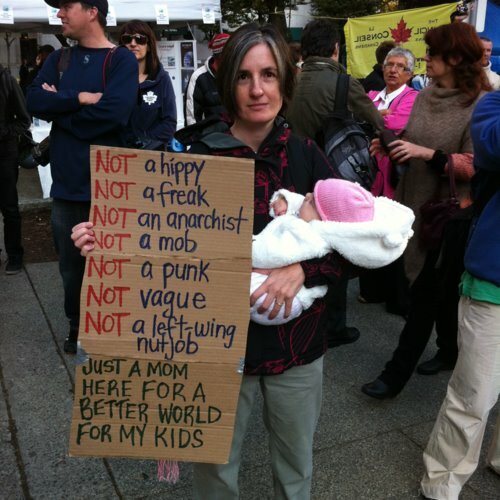 If you differ from the mainstream in any way, celebrate it. Don’t apologize for it. You are a woman after my heart! I don’t limit myself to a vegan lifestyle any more, but I’ve been there. If you must label yourself, keep up the positive ones. The people around you will take care of the others. Good luck! The gluten-free lifestyle is even more difficult than vegan, but we’re working on it around here as well. So many times I’ve wished that I hadn’t educated myself on so many food and chemical issues because it certainly makes life more challenging, however, if we don’t change how will others around us learn. I feel the same way! Learning so much about food, I cannot in good conscience continue to eat so many “standard American diet” type foods. I used to eat Doritos as a meal… now the thought of them gives me a headache. It certainly is a challenge to pay so much attention to our food, but I agree that it’s worth it to take care of our bodies and educate those around us by example. That said, I definitely had toast this morning, but I felt really bad about it. I can’t decide if I need to “eat through” my stock of wheat-containing products or if I should just go cold turkey and get rid of it all. I know gluten’s bad, it’s just addictive… argh. Good luck with your gluten-free goals, and thanks for reading! Excellent post! I am vegan except for ‘good’ eggs. For me, it is both health and i love and respect all life. The questions I get are unbelievable from supposily intelligent people. I also quit wearing leather. My favorite line I always get is ” I love animals too”….as they are eating one. What do you wash your hair with? I think gluten/wheat free is becoming much more ‘mainstream’, at least in the UK, as more people have an intolerance to it, so it’s another option on (some) menus. Went to a veggie restaurant the other day- veggie/vegan/gluten free options aplenty! Hooray for options!! I think I will probably start to reintroduce a few meat products to my diet, but I’ll probably always be “vegan out of the house” because I just never know where the meat comes from. Food shouldn’t be this complicated! Great post, Caitlin, it’s good that you are seeing your labels as detrimental. I don’t like labels of any kind. I was labeled a “cripple” as a child being born with a disability. It was limiting and left people with lower expectations of me. My sons were labeled, one genius the other ADD. This left them in school with different expectations from their teachers, one was humiliated if he missed a single answer, the other was told he would never amount to anything as an adult and no one would hire him (for the record he is 25 and with the same employer for 8 years, as a boss). When my son (with ADD) would tell me he couldn’t do something I would look at him and ask if he was really going to say that to me. He would laugh and then apply himself and accomplish what he previously believed was too hard. We learn to label not at home, but in school and in social settings, the only way to break this is to stop accepting that labels are acceptable. Thank you for sharing your story. I agree, we need to stop the labels — they really aren’t doing anyone any favors. I have to admit, when we have mainstream friends over (we entertain quite a bit, but most of our friends are counter-cultural types! ), we kind of play up the “weird.” Take my daughter’s preschool home visit, for example. The first time her teachers came over, we made sure that we were dancing to the Victrola and drinking out of mason jars. They sat on the floor for the visit, and fell in love with our kitchen. THEN, they both started reading my blog! Haha, that is fantastic! Thank you for telling your story 🙂 I am glad “weird” got you some new followers. I don’t know Caitlin, I think crazy and freak are compliments, not detrimental. I see your point, but I think it’s best to only use those words with like-minded freaks. We must only let our freak flags fly with other crazies! However, I do feel that sometimes vegans or health nuts can be just as judgemental. I feel like I do love animals even though I eat meat (I’ve given money to animal right organisatons for many years), and I’m really trying to eliminate commercial meat amongst other things. The thing is we are all different, and I know for myself that meat is absolutely essential to MY body being healthy. So I think that if we don’t want others to judge our eating habits, we should think twice before judging other’s aswell (even though I know I do it myself also). Alcohol is a tough one. If you don’t drink, people assume you’re an alcoholic, even if you’re not. I think a simple “Drinking doesn’t agree with me” would do it. Thanks for your comments about healthy bodies depending on the person. It’s nice to see so many like-minded (tree-huggin’ hippies) people out in the interwebs. I try not to judge people’s eating habits harshly, and I always try to come at them from a place of education – here’s why McDonald’s isn’t a good choice, vs. OMG THAT IS POISON. Vast difference! I have to say that I haven’t really spoken to my aunt in a while, so I don’t know what her game is at the moment. I just found it interesting that sometimes it’s easier to say that you’re an addict than to just say drinking doesn’t agree with me, as you say. People are really sensitive when it comes to food and drinks. I’ve come to realize that the more comfortable I am, the less other people will react. I was at a dinner party once with people I didn’t really know that well, and was asked if I wanted wine. I just said no thank you in a pleasant way (I hope), and no one seemed to care. Also, just being honest and vulnerable also really works. Just to say, “you know, I haven’t really been feeling all that great, and I think it helps me to not eat or drink this or that, so I’m trying it out”. I’ve been known to tell people I have a milk allergy just to really hit the point home that I don’t want any milk in my food. Allergy works better than “Oh, I’m vegan.” Lactose intolerance usually works too, if people know what it means. So I totally get it. Sometimes people just don’t understand that you prefer not to eat a certain thing if you don’t make it a bigger deal than that. I agree that saying “It makes me feel better not to eat this” usually gets people the rest of the way to understanding that you’re really not going to eat it. I’m still a little snarky that I ate that bun! Comfort eating for me is now a bar of dark chocolate. I’ve come a long way from Doritos and Twix bars. The thought of junk food makes me feel ill nowadays. I never thought I’d see the day! You must have not been gluten free when you ordered spaghetti with just the sauce:) I have 2 kids with Down syndrome and they both have Celiac disease. In addition one has Type 1 diabetes. GF is not for the faint of heart. Nope, I’m now GF and I do eat meat. But only humanely raised animals. It’s an evolution of food habits. GF is definitely improving health and wellness though! It must be really challenging to keep track of everyone’s needs in your family. My friend has a GF/DF son with PDD-NOS on the autism spectrum. It definitely gets overwhelming. I will send some good karma your way! 🙂 Thank you for your comments. I was vegan for over a decade (and vegetarian for a few years before that) – until I moved to country New Zealand. In the city – I was living in Melbourne, a city of 3.5 million people – being vegan is easy. Here it’s hard. Really hard. If you want to eat out as a vegan its hot chips or green salad, and everything is cooked in animal fat. Dairy is a national religion. So is meat. I guess what I’m saying here is, be gentle on yourself. Sometimes we push ourselves to high standards and forget that life is meant to be fun. Eating out is meant to be a social pleasure, not a ring-ahead challenge.